The idea of outsourcing is not new. It started way back in the 1700s when manufacturers started shifting the manufacture of goods to countries with cheaper labor during the Industrial Revolution, following the precepts of Adam Smith in his book 'The Wealth of Nations'. The history of outsourcing to India is an interesting story. Even after over a decade of competitive global outsourcing, most of it still goes to India. Reaching this pinnacle in outsourcing has been a long journey. As land, sea, and later, air routes developed between the 15th and 21st centuries, more nations started to outsource trade to other nations, eventually leading to outsourcing to India and other nations. Why do companies actually outsource? In earlier times, cost and headcount reductions were the most common reasons to outsource. Today, the drivers are often more strategic, such as how a company can best utilize its own core competencies. Though the outsourcing of manufacturing is an old story, outsourcing to services is a relatively new phenomenon. Services outsourcing to India started in the 1980s and rapidly accelerated in the '90s. In today's world where information technology has become critical to business, the meaning of outsourcing has undergone a drastic change over the years. Companies have started focusing on their core competencies and outsourcing many non-core functions, for which they had no competence internally. Although the IT industry in India has existed since the early 1980s, it was the early '90s which saw the emergence of outsourcing. First, some global airlines began outsourcing their back office work to India—and then IT companies followed. Some of the earliest players in the Indian outsourcing market were Texas Instruments, American Express, Swissair, British Airways and GE, who started captive units in India. Over the years, the industry has built robust processes to offer world class IT software and technology-related services. India offers a unique combination of attributes that have established it as the preferred destination for IT-BPO. Advances in technology and communication have allowed transnational companies to rapidly globalize at a very low cost. The cost of managing workers in a distant location had fallen drastically, and the need to outsource became stronger. Significantly, India also began efforts to open up its economy to the world. Since the onset of globalization in the early 1990s, successive governments have pursued programs of economic reform committed to liberalization and privatization. The government started easing restrictions and liberalizing the economy, which has helped the country see rapid economic growth. Developments in telephony, fiber optics and satellite communications made Internet-based communication and transfer of data possible, paving the path for outsourcing to India. The telecom industry in India used to be a government-controlled monopoly and the market was small. By 1999, the government introduced policies which played a key role in reshaping the structure and size of the telecom Industry, allowing commercial entities to participate in almost every industry segment. The new telecom policy brought in further changes with the introduction of IP telephony and ended the state monopoly on international calling facilities. The government's liberalized investment policies have resulted in several foreign companies entering Indian markets, which has been a major contributor to the growth of the Indian economy. In addition to the central government's intervention, state governments are also competing with each other to offer more favorable business environments in order to attract IT/ITES companies to set up development units in their states. This kind of competition is helping the industry grow at an astronomical rate. Indian companies are enhancing their global service delivery capabilities through a combination of greenfield initiatives, cross-border mergers and acquisitions, partnerships and alliances with local players. Global software giants like Microsoft, Oracle, SAP and many others have established captive development centers in India over the years. Indian authorities have made efforts to further strengthen the information security environment in the country, and special initiatives have been taken to enhance the legal framework. Many companies in India have already aligned their internal processes and practices to international standards such as ISO, CMM, Six Sigma, etc. 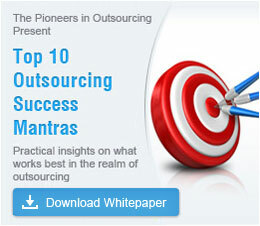 which have helped establish India as a credible outsourcing destination. The IT & BPO sector has been a key beneficiary in India's growth, with the cost of international connectivity declining rapidly and quality of service improving significantly. India's National Association of Software and Service Companies (NASSCOM) has played a critical role in outsourcing by acting as a coordinating body for the industry. It conducts surveys and conferences which help in the dissemination of knowledge and research in the outsourcing industry. As per NASSCOM, "While India's low-cost talent pool has helped its businesses grow, global incumbents have also recognized India's inherent advantage and have mastered this capability by off-shoring more work out of India." India's competitive advantage lies in its ability to provide huge cost savings and thus enabling productivity gains. Abundant, skilled, English-speaking manpower, which is being harnessed even by ITES hubs such as Singapore and Ireland. High-end telecom facilities and infrastructure which are on par with global standards. Better focus on maintaining quality and performance standards. Fast turnaround times, and the ability to offer 24x7 services based on the country's unique geographic locations that allow for leveraging time zone differences. A friendly tax structure, which places the ITES/BPO industry on par with IT services companies. India has become the largest player in offshore delivery with levels of work delivered that are amongst the highest across several verticals. The supply-side elasticity of skilled English-speaking manpower across technology and non-technology spaces is unmatched. The success of the industry has resulted in Indian companies looking at acquisition targets worldwide, and the Indian service provider community is being viewed as a "strategic business partner" and not just an IT services vendor. The compounded annual growth rate (CAGR) of the industry has been over 25% in the last five years. Over these years, four main components have formed the industry, IT services, BPO, Engineering Services and Hardware. Banking and Finance & Accounting Services, Telecom, Manufacturing are among the top 4 verticals for both export and domestic market. While hardware dominates the domestic market, IT services tops in the overall industry. Today, Indian companies offer a wide variety of outsourced services ranging from medical transcription, customer care, medical billing services, database marketing to Web sales/ marketing, accounting, tax processing, transaction document management, telesales/ telemarketing, HR hiring and biotech research. Outsourcing to India has been a satisfactory and profitable experience for most companies around the world. Indian outsourcing vendors have continuously adapted to internal and external challenges and the credit for this goes to Indian outsourcing companies and the successive enabling governments. Outsourcing in India has faced adversities due to the state of the world economy and the ongoing recession, but it is surely here to stay. If you want cost-effective services without compromising on quality, look no further than Outsource2india. We have skilled, experienced and well-trained professionals who will provide you world class services. When you outsource to O2I, you can be assured of a quick turnaround time. Outsource you requirements to O2I and benefit from our expert, efficient and technology-driven services. Contact us with your outsourcing requirements.